In 1998, emerging out of a burgeoning population of dingoes in our small acreage at Keilor,and many years of searching, we finally located what was to become the Dingo Discovery Centre, nestled on a picturesque hillside, surrounded by state forest, yetstill within commuting distance to the Melbourne CBD. After a lifetime of fascination for the dingo, we had kept our pack undercover leading up to legalisation of ownership in the early '90's. 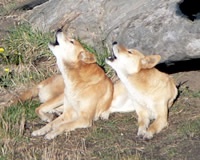 It was our mission to educate the public on this amazing species, and as earlier supporters of the late Bruce Jacob's Dingo Farm wished to continue to work for further awareness of the role of the dingo in the wild eco-systems, and put the crazy misunderstandings which surrounded Australia's native dog to bed. The wondrous fact that our pure dingoes represented an unbroken lineage from the original wolf/dog which greeted the first European explorers, and stretched back through a history of at least 5,000 years of isolation on this continent is a marvel to us. In the face of those who would totally exterminate the dingo, we wanted to keep this original animal pure for future generations to admire. We would certainly prefer that the continuation of the lines be in natural habitat, and not as a captive bred species. We undertook the Land for Wildlife scheme and we designed and built our own home to overlook the dingo enclosures, so that we could observe them at all times. We moved ourselves and our dingoes to Toolern Vale on September 11, 2001. What a date! We open to the public by appointment, and we run open days during the puppy season. At that busy time we also visit as many schools as we can squeeze into the spring months, taking our message to those young Australians who will inherit the governance of the environment. With our enthusiastic band of volunteer helpers, we also attend local fairs and expositions at shopping centres throughout the year. As life long faithful keepers of the pedigrees of our pure dog breeds, and with a deep background in the pursuit of excellence, we developed a special respect for what was probably the purest "dog" on earth, yet had no documented pedigrees. 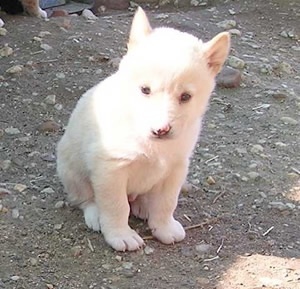 We were avid supporters in the development of the DNA tests for dingo purity, finding the old method of morphology testing after death totally frustrating. Since 1994 only DNA tested dingoes which fulfilled our stringent standards have been kept and bred here. In the year 2001, through a national dingo organisation, we established a stud book for the species, meant to be open to all owners, in which we hoped ultimately to record the total pure population in Australia, and make available annual updates to all on CD format. Sadly that project failed and is now a mere incomplete fragment of the true picture of the species in the current control of an individual establishment. We have had lots of time to think out and become wise on the dingo position on all levels, and this is continually being affected by new scientific information, current legislature, and a host of other variables. We have had to justify the harsh realities of ongoing loss of habitat and escalated baiting campaigns. The dingo species is not a lot of individual animals running around making a sad and solitary living in the bush. It is a total social heirarchical system, which needs the ongoing seasons to teach young and to control territory and hone instinctive survival tools and evolutionary dictates. We are slowly coming to terms with the fact that the wild dog and the dingo are but one evolutionary animal, filling the niche of keystone eco-modulator. The dingo needs vast spaces where it can reside unmolested. In the absence of that requirement, we have also had to come to terms with the fact that the dingoes under our control must therefore be made fit to live beside the enemy, man, for the time being at least. We therefore attempt to make life bearable for each dingo born at the Dingo Discovery Centre by socialisation to the mandatory captive life, hoping always that there will be better days ahead, where the noble original dingo may once again be free to rule his domain in safe bush. We have accepted the bitter truth that this will not come about within the lifetime of one animal, but will take generations. We fervently believe that the inherent instinctive behaviours will always lay dormant and ready to take over so long as the genetic purity of the animal is maintained. The only way that can happen is via parliamentary methods. That is where we, and an enlightened youth must bring pressure to bear. Education is the key. in-perpituity with a beneficial board balanced in such a way that malicious political takeover and autonomous control is not possible. Sadly, in over two decades participating in numerous dingo societies we have observed too many destructive actions based on human ego, which throughout history has not served the dingo well. There are too many powerful self serving enemies of the dingo in pastoral groups and government departments for the advocates of the dingo to be devisive. A rank closing alliance of dingo lovers must arise if emancipation of Australia's top terrestrial predator is to be envisaged as a reality.